Memorandum of Understanding | "The Voice of the European Services Sectors in International Trade"
The European Services Forum (ESF) is a network of representatives from the European services sector committed to promoting actively the interests of European services and the liberalisation of services markets throughout the world in connection with international trade negotiations. 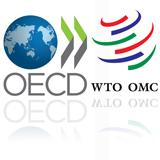 Ø Specific actions, when appropriate, during the negotiating processes (missions to Geneva and to territories of negotiating trading partners, etc.). To state and advocate the business case for a successful outcome to trade in services negotiations. To develop a partnership with the EU institutions regarding positions to be taken by the EU in the trade in services negotiations. To obtain and make available documentation in connection with ongoing trade in services negotiations (e.g. service offers, proposals). 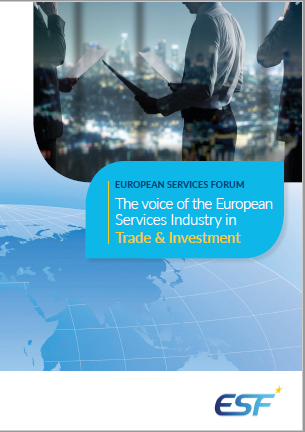 To be a forum for discussion of international trade in services related issues for the European services sector. To be a contact point for the services sector of third countries. Maintain contacts with the services sector of third countries, where appropriate, to identify issues of common interest and create synergies. Develop and promote, on behalf of European services sector, the case for a successful outcome to negotiations on trade facilitation that integrate the contribution of the services sectors in any agreement. Develop and promote, on behalf of European services sector, the case for better investment regulation, better competition regulation and better public procurement regulation in the trading partners, as well as a better business environment based on non discrimination, transparency and the rule of law. A side, though related activity, is the co-sponsoring by the ESF together with BUSINESSEUROPE of the European Services Platform (ESP), an informal platform, which allows to look at the interface with the internal market dimension of trade in services while offering at the same time a place where the European Services Industry can exchange and further raise its profile. The European Services Forum shall maintain this range of activities, subject to further review every three years. To be operational ESF is supported by a light and flexible structure. Ø A small permanent Secretariat composed of one professional, to serve both the European Service Leaders Group and the Policy Committee, to organise and co-ordinate the ESF work such as communication of information/documents, co-ordination of consultation, preparation of papers/briefings, organisation of meetings, and to establish the appropriate contacts. Care will be taken to ensure that the ESF’s website remains a useful tool for ESF members to follow the development of international trade in services negotiations. A member’s only section will be developed to allow for the uploading of non-public information. Official views and positions on behalf of the European Services Forum shall be prepared by the Policy Committee which shall act in such a way that individual members which disagree with such views or positions shall be allowed to dissociate themselves therefrom. The ESF budget will cover essentially the costs of the Secretariat. These costs will be covered by contributions of the members of the European Services Forum. The Policy Committee will adopt the annual budget. Financing of occasional events in the ESF framework will be examined on a case by case basis.